It’s been a crazy busy week here already. On a whim, I decided to take back my breakfast nook. I have been using it as a craft nook for the past year, and as my supplies keep growing, I have just outgrown the space. You see, my craft nook has undergone about 5 different make-overs in the past year, and now she has moved to a new space…that’s another post entirely. Now I have a new pretty space to enjoy my coffee, and my family can join me. This also gives us extra space for holiday dining! It all started with this chippy little corner shelf. I found it, and just didn’t know what to do with it. I put it on my desk for a bit, but kept thinking that it needed somewhere to shine. Then, last week, I decided to bring my things home from my shop. I’ll tell you all about that later…it’s completely drama filled, and to be honest, I just don’t want to go there right now. So…now that I had all of my loveliness back home, I knew exactly what I wanted to do! I hung the shelf in the corner, brought my table and bench in, then got to work! I started grabbing things and moving them here and there, then I remembered that I had an ugly old shutter in my garage. I threw some oops paint on it and put it in the corner, and oh my…I love it! 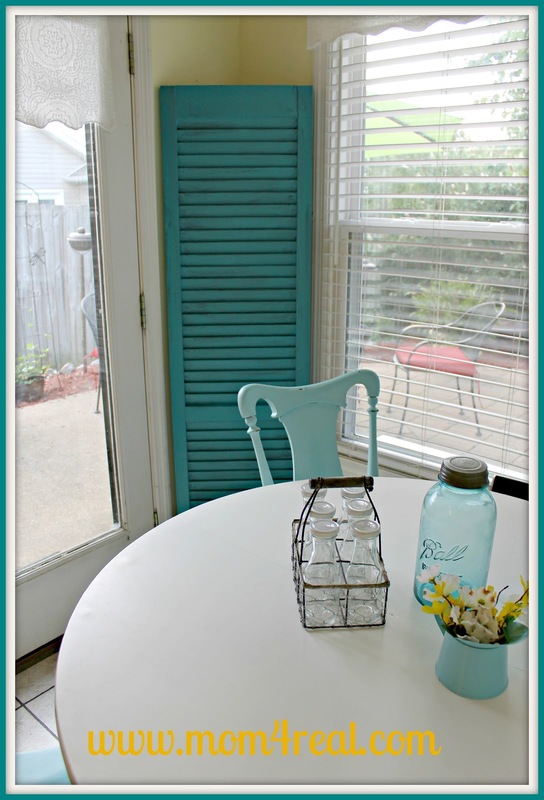 Now I want shutters everywhere…back to the ReStore for me this weekend! 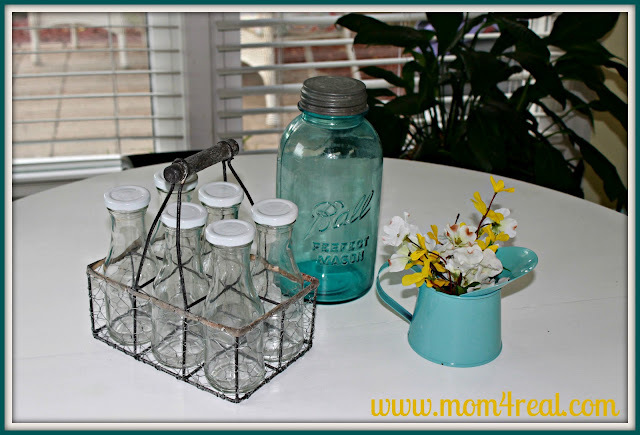 I bought these glass bottles and carrier from Decor Steals a few weeks ago, and now I know it was fate! They belong on my round table with the old mason jar my mom gave me a couple of months ago. 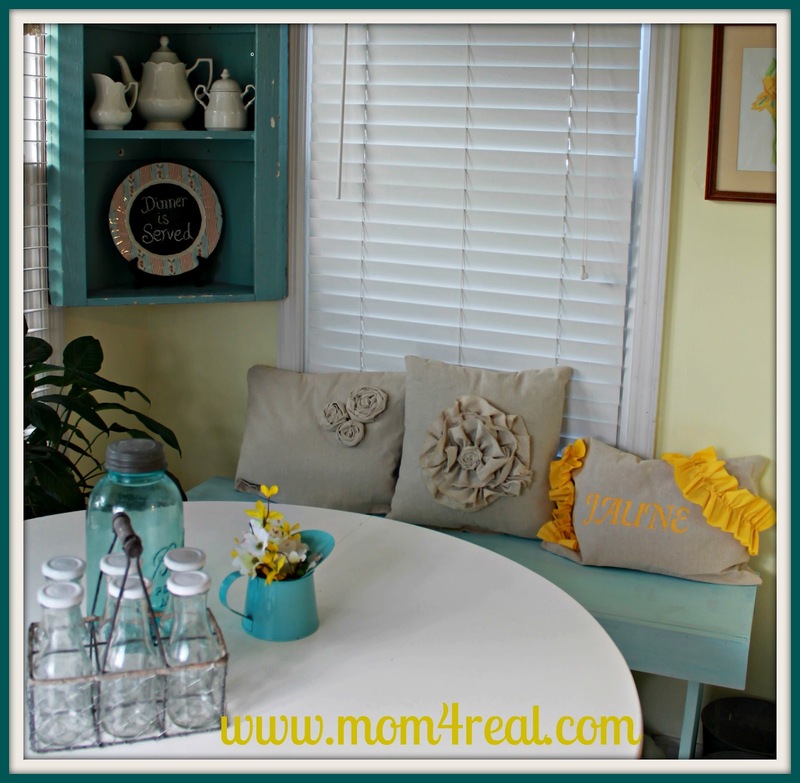 My Beachy Blue Bench got a new coat of aqua paint and my Dropcloth Pillows have a new home! I just love it when everything comes together like it was meant to be. I am so happy to have all of my things back in my home, living together in perfect harmony. Cue the Ebony and Ivory. So, who wants to come over for brunch? I’ll make mimosas, and we can read magazines! Super fresh & pretty girl. Nice job! It’s beautiful! I really love the shutter in the corner! Gorgeous. What a classic color combination! Love it! I especially love the shutter. You could hang all kinds of fun stuff on it! Really looks great and cozy! So bright and cheery. A perfect place to wake up and have breakfast. Love! I love it! It looks so great!! Thanks for stopping by my blog. I love all of the aqua. Now your follower as well! I am in LOVE with your kitchen girl. HOW pretty and I love your style and color choices. Cute pillows too! What time should I be there? I love the redo. Everything looks wonderful. The shutter is great! I put the shutters I made next to my picture window and I love it. Thanks for sharing at the All Star Block Party. This is exactly what I want in my dining room! So bright and cheery. I have the table and chairs, just gotta find a cute corner shelf!!! Beautiful room. Alright, I am Coming over Next week for a whole week. Can you handle me that long? Jess- In love. Love the colors, not too bright, prefect amount of Pop! I would LOVE more then Anything to come over and share some beverages with ya.. talk some crap and read some magazines!! :) Great job Girl!! I’ll be right over – you had me at mimosas! Then you could fill me in your your drama-filled saga! 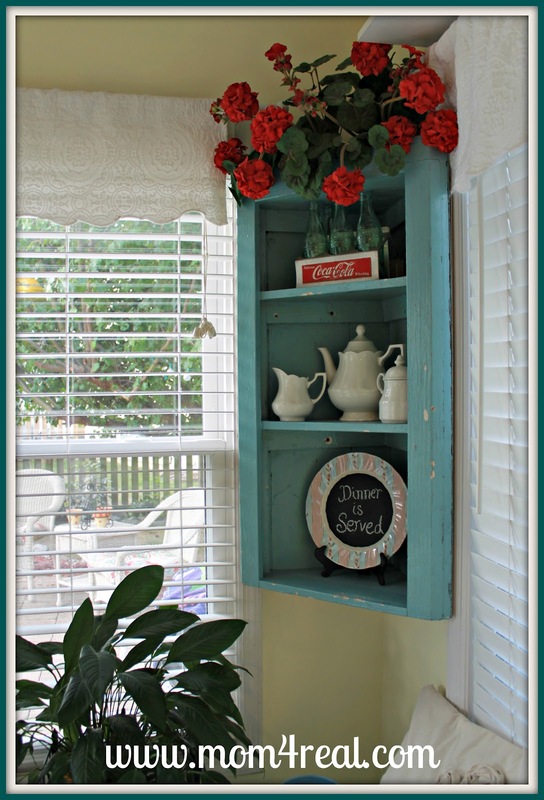 I love your shutter & cabinet-the perfect shade of blue! In fact, this would be perfect for our Crazy About Color link party on July 31! Oh Jessica!! This is absolutely PERFECT!! I love it as your breakfast nook!!! LOVE the blue here and there! You MUST tell me about the shutter in the corner! I’m working on two for Emanuelle’s headboard… do you paint it.. how did you go about it? I love the turquoise accents. Especially the shutter! This is precious! Love the red accents in the upper right corner. Nice job. Visiting from Tickled pink at 504 main…This is just the most perfect breakfast nook. I would never want to leave it…breakfast lunch and dinner. I love the colors you used! I just remodeled my laundry room and I used the same colors but also used red!. I hope you will drop by for a visit! what a great space you created for you to enjoy! relaxing colors! Love what you have done with this space–the colors are great! I love that corner shelf- it looks perfect between the two windows! It is so sunny and inviting! What a great place! This is adorable! 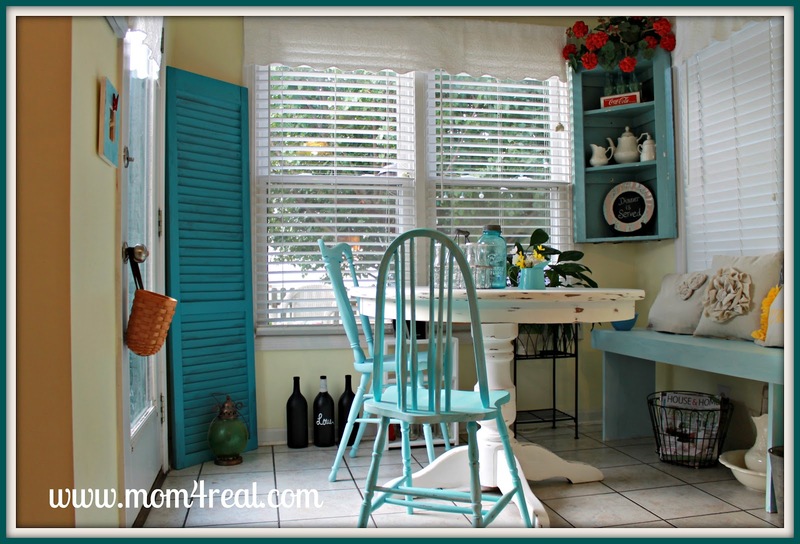 I love the colors, the chairs, the little accents (especially that little milk bottle carrier). It’s all fabulous! Thanks so much for linking up to Pretty Things Thurs! I love your nook space! I have windows that come pretty far down like yours and I have had a hard time thinking anything would look good in that little end of the kitchen so it has sort of been a relegated junk pile. Now that I’ve seen yours, I know something will look good there! I don’t have the talent to copy you, but I’ll think of something! Thanks so much for posting this! What an adorable space. I just found your blog through the Serenity Now link up. I’m your newest follower. I love the blue shutter. I’m loving the color palette. It looks to so cozy and inviting! my favourite colour scheme!! Love everything!!!!!!!! Beautiful breakfast nook . I would love to come for a tea but I live in Southern Georgian Bay, Ontario.Canada. I love what You did and I am guessing this is some of the things you did to sell..and nope did not sell so you are now able to have things you made with some love for others…and you get to enjoy…would love a cup of DDp I am not a coffee or tea drinker but looking at mags…getting inspiration you bet…enjoy and drink up….love what you did…but show us where you create now….curious…. This turned out fabulous! Love the colors. Thanks so much for linking up at LLR. Hugs! I’m so jealous, I want a breakfast nook! Yours is beautiful. If you get a chance come link up your reveal at my Pin Party. What a great little breakfast nook. So cute! Stopping by from My Uncommon Slice of Suburbia. I love your color scheme! I am your newest follower… when you have time I’d love for you to check out my blog! What a bright, adorable room! I love the color and the things you’ve chosen to show off there. Can you tell me about your window valances? Are they matelasse? Jess, I featured your breakfast nook on this week’s party! Very pretty! The color is beautiful! Love it! 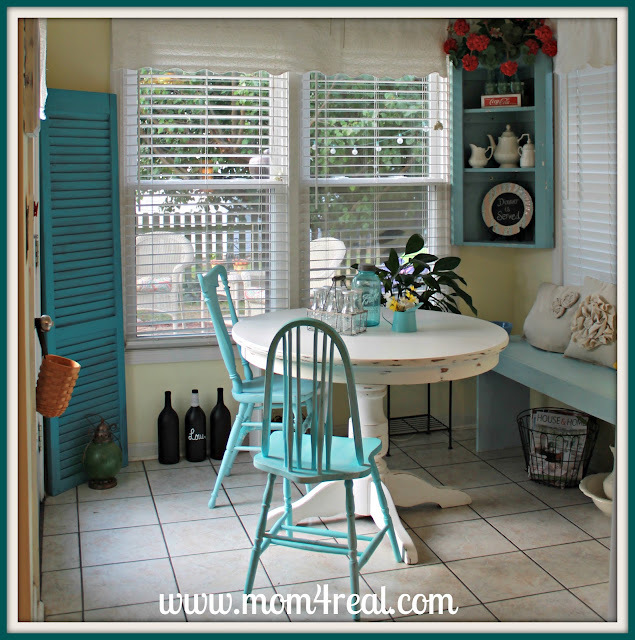 I’m in the process of redoing my breakfast nook too and you’ve created an inspiration! Love the shutter! Fun cheery space. Great space – love it! The colors are perfect! Would you swing by my linky party happening now to link this up? I also have a givaway going this week there as well! Thanks! Love the colors~ looks fantastic! Thank you for linking up at Feathered Nest Friday! Hope to see you again this week! Very nice. Lovely colour combination. Fresh and welcoming. Sorry Shannon! I think the aqua shutter needs to go to me! Love your cozy room…wish I could join you for coffee and fruit this morning! I love vintage kitchen styling. You did a great job pulling all of these elements together. Just enough pop of red to add some drama! Absolutely LOVELY!!!! I’ll be right over. I’m a new follower and would love for you to visit and follow me back! Again, just beautiful! I’ll be right over!! Love the aqua and yellow combination. Soooo cute! Your chippy corner shelf is wonderful too. I love the two color tones you used rather than go all bright aqua. It really adds some dimension. Very relaxing space! You are good! I could not in a thousand years take those items, put them together and have it look like your space. So glad to see you at our All About Color party -you really know how to rock a colorful room! Love the blue and that shutter is perfection! Pinning this! SUCH a gorgeous spot…and I’m sure when you change it again…it’ll still be beautiful. 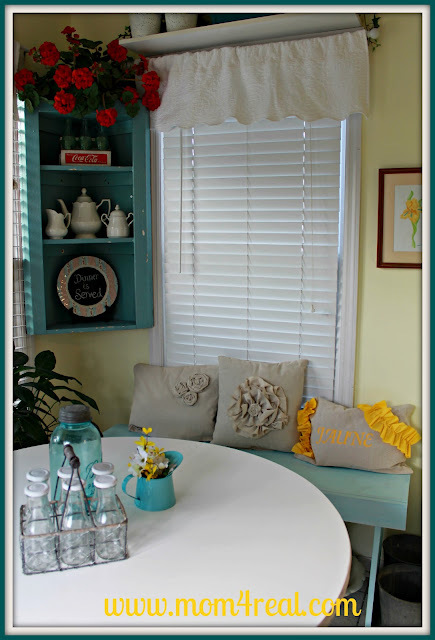 Your breakfast nook is so adorable, I absolutely love it! I’m now a follower and I’ll be back for more to read:) I found you from Coastal Charm! I love your breakfast nook and absolutely adore it, love the colors and the shutter! I’m now a follower and I’ll be back for more of your great posts! Cute pillows too! It’s gorgeous! Do you happen to know what color paint is on your chairs? It’s the exact color I’ve been looking for! Happy to feature you at Crazy for Color! Just found you and now following. Saw your nook on your kitchen revamp post this week. Can I come over for breakfast? I want to curl up in the back corner of the bench with some coffee, Eggs Benedict and a book. Love it! Saw this on hometalk. It looks great! I’m redoing a hutch for my kitchen with a similar color and I’m so excited about it! Love the pop of yellow, too. Since I’m redoing the kitchen cabinets, too, I’ll have to think about that! Great job!